I'm a fan of positive dog training, valuable lessons that I prefer to call dog teaching. While I'm not a dog teacher, I talk with many people around the world who work with a wide variety of dogs displaying various behavior problems, and across the board they agree that positive training is the way to go for getting the best, most consistent, and long-term results. I recently received a video of Holly, a dog, being hit - cuffed in the neck - by, and later biting, Cesar Millan. I had not seen it before. In this video, Mr. Millan moves closer to Holly while she's eating. Holly eats faster as he moves in and immediately moves away as he continues to approach her. Holly gives him plenty of warnings -- don't come any closer -- because she needs her space to feel safe. Mr. Millan ignores these warnings then cuffs her in the soft part of her neck; you can see this at 0:44 of the video. After talking briefly with Holly's human companion, and with Holly appearing to be relaxed but still stressed, Mr. Millan swipes at her face and Holly then snaps at and bites him on the hand, drawing blood; you can see this at 3:44 of the video. Mr. Millan admits he "didn't see that coming." He goes on to back her into a corner. 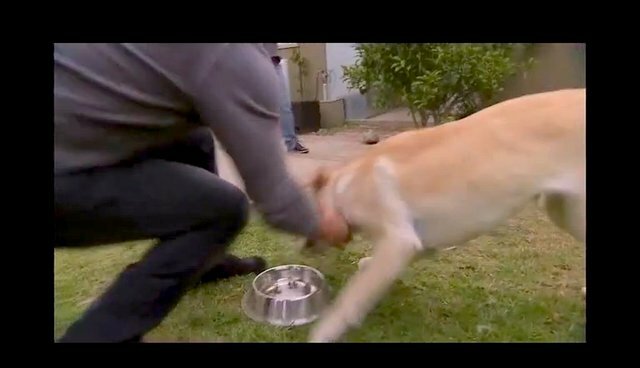 This short video is a wonderful example of dog body language. I think of it as a crash course in canid ethology -- dog behavior 101. I highly recommend those people who want to see what happened to study this video very closely. I've watched countless hours of video of a wide variety of social encounters in various canids -- members of the dog family -- and I still learned a lot from this encounter. I watched it more than a dozen times and I'm sure I'll go back to it. There are many lessons in this video about how dogs communicate what they're feeling using all parts of their body and various vocalizations. There also are valuable lessons for the need to respect what a dog is telling us, what they want and what they need. Holly was very clear about her state of mind, what she was feeling, and what she needed.